Air monitoring is a critical component of many Quality Control systems Air monitoring equipment ensures that a work environment is safe for the people working in it, and helps prevent against the spread of contaminates. There are a few different things to consider when implementing an air sampling protocol if you’re looking to guarantee the best possible results. Different environments are prone to different types of contaminations, and have different monitoring requirements. In Pharmaceutical, Biotech, and Hospital environments, the air in the clean room environments must be tested for both non-viable particulates (e.g. Dusts, skin flakes, aerosols, , pollen, etc. ), as well as viable particulates (e.g., bacteria and mold). Different equipment is required for testing for these two different contaminants, which includes unique sampling equipment for collection and detection. It’s critical that you identify your specific needs before beginning an air sampling plan. Our V100 Controller with our R2S , RAS , or RCG sampling heads , and our P100 air samplers , for example, are designed for the capture of microbial particulates. Every environment demands its own standard of testing. In some cases, a quick, small sample size is all you need to get an idea of the air quality. In others, you may need a longer sample collection period with a larger total volume, allowing you to gather more particulates and make more inferences about the work environment around the sampler. Different samplers offer different potential total capture volumes (10 cubic feet, cubic meter, etc.) and sample collection rates (e.g., 28.3, 50, or 100 LPM) – -always cross-reference these sampling parameters with your sampling requirements. Much like any other piece of high technology, the data collected from the air sampling equipment is most accurate when the operators using it are appropriately trained.. Spending some extra time or money to purchase a sampler that has an easy-to-use interface often pays big dividends in the end, as it limits the learning curve for new employees and gives you results that you can count on as accurate. User error is a consideration in any field, but user error (e.g., false positives and/or false negatives) with air sampling can have dire consequences (e.g., impact lot release, cause product loses, etc.),. Overall, choosing air monitoring equipment demands a strong understanding of the fundamentals and a clear vision of your exact needs. Whatever it is that you’re hoping to get out of your equipment will depend on the sampling patterns you wish to follow, and there is sure to be a sampler that falls directly within those parameters. 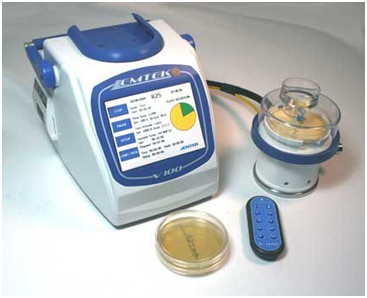 For more information about microbial air samplers please visit www.emtekair.com or contact us at 877.850.4244.